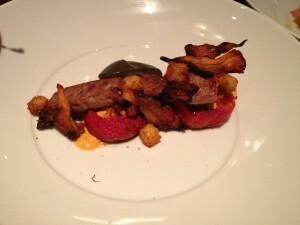 Roasted beefsteak tomato ($16) – it was served with lamb neck and mushrooms. The tomato was seasoned aggressively with harissa, making too spicy for me. It is hard to see in the picture, but there is a dark color glob at the top of the plate. It tasted of charcoal and ash. It was awful. We couldn’t figure out what it was. We were told it was a “charred cornbread puree” It was an epic fail. They insisted on taking this dish off the bill. 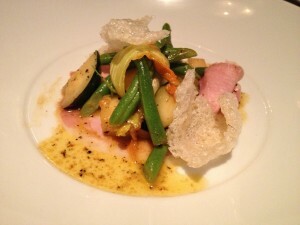 Summer squash with smoked pork loin ($14) - the pork appeared to be a close relative of Sara lee deli meat and the pork rinds were stale tasting. They should call 555 Meats in SF to learn how to make chicharrones correctly. 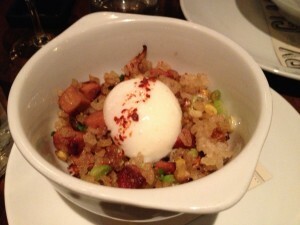 Farm egg ($12) – This was fun and unusual. It was just like Mama Tsoi’s fried rice, but the rice was crispy, bringing the dish to a whole new level, texture wise. 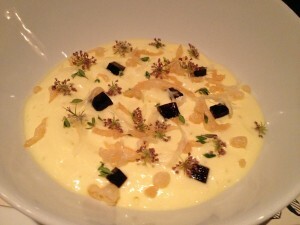 Chilled corn soup ($12) – This was the most unexpected and fascinating of all the dishes. The texture of the soup was similar to a very loose foamy custard. There were little surprises nestled in the bowl; gelatinous cubes, crunchy croutons and flowers. The summer corn flavor was pronounced. We shared the “Luau Treats” for dessert ($8). It was haupia, a tradition Hawaiian coconut dessert. It has a consistency similar to a very stiff Jell-o. I liked it, Marc did not. 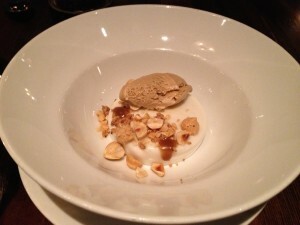 There were also tiny coconut coffee meringues, coffee ice cream, caramel sauce, toasted hazelnuts. Our waitress forgot to bring me my milk. 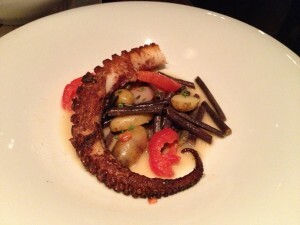 I think Empire State South has some innovative dishes, but also some failures. The price point is high and the service was inconsistent. I really wanted to like it, but I didn’t. On our walk home we passed Gladys Knight's Chicken and Waffles restaurant and I tried to convince Marc to get fried chicken for dessert to no avail.